From rugged utility vehicle to big luxury SUV, the Toyota Land Cruiser has had quite a journey. While it still maintains its off-roading capabilities in the modern model, this Clermont Toyota SUV is filled to the brim with luxury features for optimal posh and style. If big and luxury are what you’re looking for in your next vehicle, then this has your name written all over it. At Toyota of Clermont, we have all the specs on this Toyota luxury SUV, so you can get familiar before you take it for a test drive! A 5.7-liter 32-valve V8 engine. This engine outputs 381 hp at 5600 rpm and has a torque rating of 401 lb.-ft. at 3600 rpm. 8-speed electronically controlled automatic transmission. Four-wheel drive with Active Traction Control (A-TRAC) with differential locking. This feature is what gives this Clermont Toyota luxury SUV its off-roading capability. Independent double-wishbone front suspension with coil springs and a stability bar. This makes for a smooth ride when cruising in the Toyota Land Cruiser. 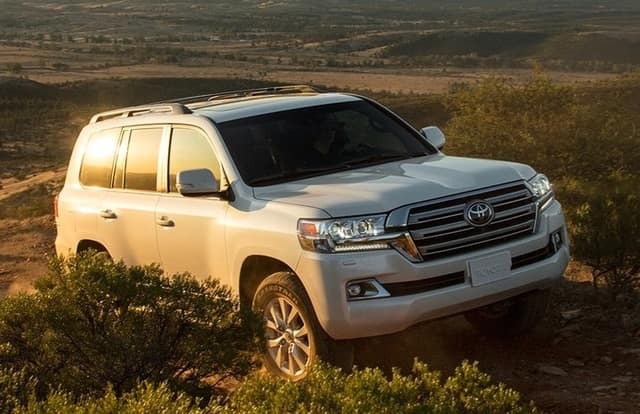 The Toyota Land Cruiser, with all its power and size, still gets a reasonable mileage rating for a vehicle in the large SUV class. It gets an EPA estimated 13 city/18 highway/15 combined mpg rating. The cabin seats up to eight passengers comfortably and seats are upholstered with semi-aniline perforated leather-trimmed seating. Color options include black and terra. Four-zone automatic climate-controlled front and rear air conditioning. Entune Premium JBL Audio with a 9-inch high-resolution touch-screen display. Optional rear-seat DVD entertainment system that includes two individual 11.6-inch display screens, and two-wireless headphones. Smart Key System with remote keyless entry and automatic liftgate. Multi-terrain selection with Crawl Control (CRAWL). LED head and taillights with integrated LED fog lights, accent lights, and daytime running lights. 18-inch 5 spoke alloy wheels. Roof storage rack with included aluminum running boards. Front and rear mudguards with skid plates. 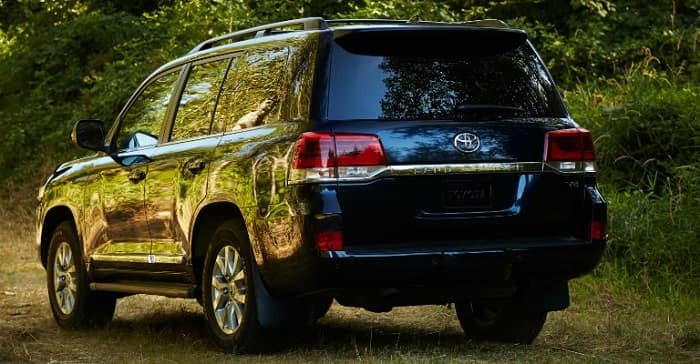 If you’re looking for more luxury in your life, the Clermont Toyota Land Cruiser is waiting for you to get behind the wheel. Come check out all the great features of this vehicle and see why this one is a must-drive. Visit Toyota of Clermont at 16851 State Road 50!